This is a cross post from 250bpm.com. There&apos;s a trope among Slovak intellectual elite depicting an average Slovak as living in a village, sitting a local pub, drinking Borovička, criticizing everyone and everything but not willing to lift a finger to improve things. Moreover, it is assumed that if you actually tried to make things better, said individual would throw dirt at you and place obstacles in your way. I always assumed that this caricature was silly. It was partly because I have a soft spot for Slovak rural life but mainly because such behavior makes absolutely no sense from game-theoretical point of view. If a do-gooder is stupid enough to try to altruistically improve your life, why go into trouble of actively opposing them? Why not just sit safely hidden in the pub, drink some more Borovička and wait until they are done? Well, it turns out that the things are far more complex then I thought. Benedikt Herrmann, Christian Thöni and Simon Gächter did a study of how people from different societies deal with cooperation and punishment. You can find the paper here and supporting material here. There are four players. Each player gets 20 tokens to start with. Every participant either keeps them or passes some of them into a common pool. After all the players are done with their moves, each of them, irrespective of how much they contributed, gets tokens equal to 40% of all the tokens in the common pool. The participants cannot communicate with each other and are unaware of each other&apos;s identities. The game is repeated, with the same players, 10 times in a row. The earnings, obviously, depend not only on subject&apos;s move but also on the willingness of the other players to cooperate and put tokens into the common pool. But free riders get an advantage. They keep their original tokens but also get their share from the pool. There&apos;s a variant of the "public goods game" where players are able to punish each other after each round of the game. The mechanism is simple. When the round ends the participants are informed about how much each of them has put into the common pool. Then they decide whether to spend some of their tokens to administer punishment. For each token spent on punishment you can subtract 3 tokens from the earnings of an opponent. The players know that they&apos;ve been punished but they are not informed about who exactly has punished them. Our research strategy was to conduct the experiments with comparable social groups from complex developed societies with the widest possible range of cultural and economic backgrounds to maximize chances of observing cross-societal differences in punishment and cooperation. The societies represented in our participant pools diverge strongly according to several widely used criteria developed by social scientists in order to characterize societies. This variation, covering a large range of the worldwide available values of the respective criteria, provides us with a novel test for seeing whether societal differences between complex societies have any impact on experimentally observable disparities in cooperation and punishment behavior. ... To minimize sociodemographic variability, we conducted all experiments with university undergraduates who were similar in age, shared an (upper) middle class background, and usually did not know each other. The results from this experiment are exactly as you would expect. The cooperators found out that there was no way to prevent free-riding and the amount of resources they&apos;ve put into the common pool steadily decreased. This result replicated across different participant pools. Particular pool may have started with a high or low cooperative behavior, but as the time went on the cooperation always decreased. Ability to punish free-riders increased the cooperative behavior in most participant pools. Free-riders learned that free-riding doesn&apos;t pay off and started contributing to the common pool. However, introduction of punishment had no effect in some of the pools. The contributions stayed more or less the same throughout the experiment in Minsk, Samara, Dnipropetrovsk, Muscat, Instanbul, Riyadh and Athens. Now that&apos;s an interesting result. What&apos;s going on there? Are members of some societies resistant to punishment or what? The reality turns up to be even more interesting than one would expect. Herrmann, Thöni and Gächter found out that participants in some societies were engaging in what they&apos;ve called "anti-social punishment". They were punishing cooperators! In fact, they were punishing cooperators so much that the cooperation-enhancing effect of pro-social punishment was entirely canceled. To make it even more confusing, the anti-social punishment, unlike the pro-social punishment which had roughly similar level in all the participant pools, differed widely among the pools. While it was almost non-existent in the West, it was common in Eastern Europe, in Middle East and in Greece. With respect to antisocial punishment, we found that both norms of civic cooperation and rule of law are significantly negatively correlated with punishment (at P < 0.05). In other words, antisocial punishment is harsher in participant pools from societies with weak norms of civic cooperation and a weak rule of law. Additional analyses show that antisocial punishment also varies highly significantly with a variety of indicators developed by social scientists in order to characterize societies. Thus, the extent of antisocial punishment is most likely affected by the wider societal background. I wouldn&apos;t have much to add to the fascinating results above, I am not a sociologist after all, but I happen to come from a country that is probably affected by this problem. Slovakia hasn&apos;t participated in the study, however, it&apos;s a former Ostblock country and as such it is very likely to have results similar to Ukraine, Russia or Belarus. Moreover, local folk wisdom, as already mentioned, has it that the phenomenon does really exist. Therefore, having all the relevant context and all the intricacies of the local culture in my head, I should be able to come up with an psychologically plausible explanation of why it would make sense to punish cooperators. It was hard to empathize with someone I disagree with on a very fundamental level, to put myself in their shoes, but I think I&apos;ve succeeded and what follows is what I came up with. Herrmann, Thöni and Gächter speculate that the anti-social punishment may be a form of revenge. You&apos;ve punished me for free-riding so now I&apos;ll punish you just that you know how it feels! And given that I don&apos;t know who the punisher was, I&apos;ll punish all the cooperators who were likely to administer the original punishment in the first place. While that, I believe, is a part of the equation, the psychology of anti-social punishment may be somehow more nuanced. Let me give you an extremely simplified toy example, just to get grip of what may be going on. When I came to Caracas, the first thing I&apos;ve done was to buy a cup of coffee from a street vendor. The coffee was very good but when I drank it I was left with an empty plastic cup. I&apos;ve carried the cup with me for several hours looking for a trash bin. I haven&apos;t found one. Finally, I threw the cup at one of the piles of trash that were heaped against the walls everywhere. If, at that point, someone chastised me for littering I would be extremely angry and I would yell at that person. In other words, I would administer counter-punishment. Psychologically, I would be angry because, apparently, everyone else was littering but it was just me who was picked for the punished. It would be unjust. Also, there were no trash bins so I couldn&apos;t had behave even if I wanted to. That doubles the injustice. Moreover, I was carrying the cup for hours, you do-gooder moron! If I was a local there may have been an additional reason to overreact: I would probably be subliminally angry for having to live among the trash all along. This would be a great opportunity to let some of that steam off! To get back to Eastern Europe, we&apos;ve used to live under communist regime where all the common causes were appropriated by the state. Any gains from a contribution to a common cause would silently disappear somewhere in the dark corners of the bureaucracy. Quite the opposite: People felt justified to take stuff from the commons. We even had a saying: "If you don&apos;t steal [from the common property] you are stealing from your family." At the same time, stealing from the state was, legally, a crime apart and it was ranked in severity somewhere in the vicinity of murder. You could get ten years in jail if they&apos;ve caught you. Unsurprisingly, in such an environment, reporting to authorities (i.e. "pro-social punishment") was regarded as highly unjust — remember the coffee cup example! — and anti-social and there was a strict taboo against it. Ratting often resulted in social ostracism (i.e. "anti-social punishment"). We can still witness that state of affairs in the highly offensive words used to refer to the informers: "udavač", "donášač", "práskač", "špicel", "fízel" (roughly: "nark", "rat", "snoop", "stool pigeon"). I also remember how, when I moved to Switzerland, a lot of my friends said things like: "I&apos;ve heard that Swiss will rat on you at any occasion." Swiss people would not understand. What&apos;s so bad about punishing free-riders after all? Tall poppy syndrome may be related. Altruism is costly signaling for wealth. Contributing to the commons, or even not stealing (or doing other antisocial things), signals that you can afford to do so. Also, there may be a common sentiment that altruism is only ever intended as signaling (of virtue, of wealth, of whatever), and is thus a status-enhancing move. In my experience, people from such societies will often not comprehend (or be very skeptical of, even when they do comprehend) the idea of acting altruistically for purely… altruistic reasons. I'm surprised nobody proposed : "This person is promoting a social norm more stringent than my current behavior, I'll whack him.". What's wrong with it ? Sure in this case the social norm is actually beneficial to the whacker, but we're adaptation-executers, not fitness-maximizers [LW · GW]. FWIW I first read this post before this comment was written, then happened to think about it again today and had this idea, and came here to post it. I do think it's a dangerous fallacy to assume mutually-altruistic equilibria are optimal--'I take care of me, you take care of you' is sometimes more efficient than 'you take care of me, I take care of you'. I'm from Eastern Europe and have this tendency. I've been quite curious about why for example any kind of activism evokes negative emotions and I think at least in my case the answer seems to be what you're proposing here. The prevalent attitude in society is to free-ride as much as you can and I'm also doing that. To answer the question from the beginning of the post, if we just let other people make cooperation the new norm, then I'll be expected to cooperate too. I want to keep not caring about society, so I guess the actions of cooperators cash out emotionally as a threat to the status quo that I want to preserve. If they have similar attitudes to mine, then the feelings are slightly positive, possibly because of receiving validation for my own behaviour. On the other hand, if the defectors are doing worse things, the feelings are fully negative, I don't think there is any effect as you suggest. To put things more concretely, I try not to do anything harmful but also don't do anything that helps society (charity, activism, environmental stuff, etc.) unless I get some concrete benefit. When someone does defect in the way of being actively harmful or breaking laws, then my emotions are negative as I said, but interestingly not as strong as in the case of activists. Perhaps because such behaviour feels normal and expected from other people, or just because it doesn't feel as much like a threat to me personally. So I would say that your second suggestion is correct in my case, I do have a sweet spot of cooperation (basically what I do and feel is justified) and dislike deviations from that, with heavier weight on the "more cooperation" direction. Well that's a mindset I don't encounter often irl. Do you estimate you're a central example in your country / culture ? Altruism is costly signaling for wealth. Or productivity. If you imagine a culture where you cannot accumulate wealth -- for example, because all you produce is food (by hunting and gathering, no agriculture i.e. no land ownership), you don't have the concept of money, the food will soon rot if not eaten, and you can only eat so much food -- the people who can altruistically donate food to others would be the productive ones. And they would be noticed, because they would make good allies and sexual partners. So even among people who obviously belong to the same social class, too much altruism feels like bragging about one's capabilities. And how much is "too much"? Depends on (sub)cultural assumptions; if the local norm is close to zero, any altruism will be seen as a status move that deserves a counter-attack. Even in socialism, altruistic behavior signals something like "in a non-socialist society, I would be more successful than you". Even in socialism, altruistic behavior signals something like “in a non-socialist society, I would be more successful than you”. … and this is an example. The interpretation you describe here is not, in my experience, an accurate portrayal of how people in socialist societies perceive things. You're not to imagine yourself better than we are. This is a total armchair reply, but -- I'm wondering if that ascription of ulterior intent is actually necessary. Like, rather than "this act of altruism is actually just intended as a status move and so should be punished", perhaps just, "this act of altruism will increase their status and so should be punished". If we’re talking about the mindset of the punishers, then I can attest to it being the former and not the latter; there is usually no secret about this being people’s motivation—they state it aloud, and quite indignantly. If we’re talking about the game-theoretical motivations behind that mindset, then of course you’re right. In some societies it might not be considered socially acceptable to want to punish someone merely because what they are doing will raise their social status. That sort of thing is dishonest because social status is reputational and meant to be earned. If someone tries to punish you for doing something to earn status, they probably did not come by their social status by honest means. In societies where people think like that, I imagine no one would want to say "this act of altruism will increase their status and so should be punished", because that is a low status motive and expressing it out loud will lower their own status. So instead they have to spin things to make their own motive appear higher status. They would need to frame things to make the altruist look as if they're the ones being dishonest and freeriding to get more social status than they've earned. Hence "this act of altruism is only intended as a status move", meaning "this person is not genuinely altruistic, you should not trust them more or think any better of them as a result of this altruism because that's exactly what they want. They're manipulating you into giving them more social status with purely selfish motives, and therefore they will not hesitate to stop being altruistic if it becomes advantageous for them later." A person making this claim might believe that they believe it, and believe that it is their real motive for punishing an altruist, whether or not it is. Because for one to admit that they're trying to damage another's reputation merely for the crime of doing something which improves their reputation would be to admit guilt of unvirtuous conduct oneself. Why do you bring up tall poppy syndrome? In the formal context of the game, Melbourne had the most pro-social punishment, and the second-least anti-social punishment. Tall poppy syndrome seems to be people who think that they're doing pro-social punishment, but are excessively suspicious of successful people. Tall poppy syndrome seems to be people who think that they’re doing pro-social punishment, but are excessively suspicious of successful people. I don’t think that’s the only cause. How about you comment on the tension between your beliefs and the evidence at hand? What does this have to do with Tall Poppy Syndrome? Since the people who engage in Tall Poppy Syndrome don't punish any cooperators in this game, the distinction doesn't matter. If you expected them to do so in this game, it directly falsifies your expectations and there is something very different to learn from it. What tension is that, exactly? Be specific, please. You seem to believe that people who engage in Tall Poppy Syndrome would engage in anti-social punishment in this game. But they don't. They engage in the least anti-social punishment and, by a large margin, the most pro-social punishment. You seem to believe that people who engage in Tall Poppy Syndrome would engage in anti-social punishment in this game. You’re reading a lot of things into my comments that isn’t there. I didn’t say this, I didn’t even imply this, and so I don’t have anything further to say on this subthread. I do not think it would. Again, this is a very rough approximation and a rather imprecise description. But I think the pattern I am describing is real. We may test this proposition by measuring relative differences in levels of charitable contributions between rich and poor people, across cultures, and see whether that relative difference is lower in Protestant-dominant cultures than in others (which is what my hypothesis predicts). What is it about Protestantism that makes it different from all other religions in altruism, in your opinion? I ask as someone who grew up in a very Protestant-dominant culture. 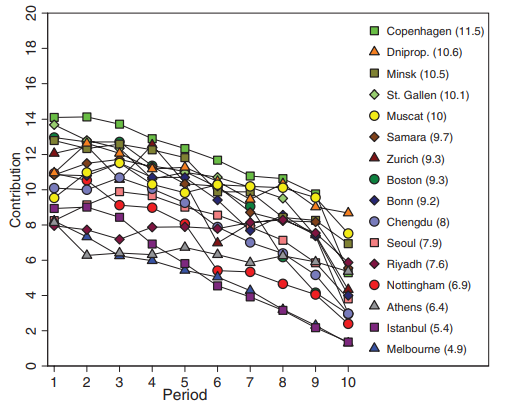 It's notable that, for countries where anti-social punishment is significant, the mean contribution across rounds doesn't depend much on the level of anti-social punishment but more on the contributions in the first round; for the 7 countries with the most total anti-social punishment, their lines are all fairly flat. Mean contribution and antisocial punishment (eyeballed from fig 2B in the report) aren't correlated within the group of 7 (R2=0.08). Mean contribution and initial contribution (eyeballed from fig 2A) are correlated within the group at R2=0.99! So in countries with low rule of law you are stuck in whatever position you start in. Pity poor Istanbul which wasn't really that bad at anti-social punishment but started at a low level and so were stuck there. Imagine the experimenters had lied to each participant about what happened in round 1 to make it seem like everyone else was contributing more. Would the players stay at the high (made-up) rate of contributions for the rest of the 9 rounds? being fairly upfront about the epistemic limits of that data and the author's current understanding. I'd be interested in followup discussion. In particular, if ever in the future someone runs a version of this experiment that included Slovakia, it'd be neat to verify if the predictions made here are borne out. I'm a little confused. The explanation you give would explain why people might punish pro-social punishers, but it doesn't really give insight into why they would punish cooperators. Is the argument that cooperators are likely to also be pro-social punishers? Or am I misunderstanding the structure of the game? When cooperatebot is an asset being farmed by an adversary, it's advantageous to destroy it. Favoring prosociality in games with unknown agendas contains a cooperatebot component. I'm not sure the authority has to be malevolent, it could be incompetent (or something). This seems to predict that people who distrust authority more will punish cooperators more. The bottom half of the punishment graph does seem to be places where I would distrust authority more. A slightly broader theory: being too cooperative makes live easy for the non cooperators (the state in the Soviet Union case, but it also works in cases when people fall for some stupid maniulations). There must be many equilibria and some cultures stay at some middle level, they don't aim at the most productive ones out of fear not to be pushed into the least productive. However, introduction of punishment had no effect in some of the pools. This doesn't seem quite right. While some of the pools didn't see their contribution rates increase when punishment was added, at least the contribution rates didn't decrease! As they did without punishment. Robin Hanson wrote about similar experiments in 2010. It seems that extreme generosity can be regarded as establishing an undesirable behavior standard. His post suggests a workaround, if your productivity/generosity greatly exceeds others: under-report your output and give credit to others. This is what a few generations of "don't talk to the police" will do. I have two opposing suspicions about this. The first is that I expect the Western countries are much more familiar with the concept of psychological tests and games. I therefore suspect that they are more likely to be thinking that this is a game, and it has a score, and obviously you should try to win. The second is based on my experiences in Baghdad; when we walked around the city we noticed mounds of trash everywhere, and so we expected the homes to be in bad shape inside. This was a mistake; the inside of a Baghdadi home was always immaculate. The conclusion I drew was that they just weren't drawing their sense of obligation from geography; there was no sense of neighborhood, only of family and tribe. I therefore expect that at least the people from Muscat and Riyadh don't react much to any kind of signals from strangers, because they didn't have any expectations in the first place. This is often what people are measuring when they say 'norms of civic cooperation and rule of law'. I'm from Samara (that Russian city from the experiment), and I sometimes face with unappreciation of contribution. Usually altruistic people are treated like idiots (why they are taking from thier own and thier close circle to feed some commonwealth? ), and sometimes with negative reaction. I tried to explain it by myself and friends with the question "why then to be a contributor?" and my view what's going on was clumsy. Thanks for that, this article is a good explanation of my native thoughts. I'm from Boston originally. Very interesting to note that Boston didn't score the highest in the non-punishment variant — it was high, but lower than Copenhagen — but scored the at the top with punishment added. That squares with my experience of my Bostonians — reasonably friendly and pro-social but not as much so as say Scandinavia, but very much willing to get righteous if someone is defecting, probably moreso than Scandinavia. But then, reasonably quick to forgive if someone did bad but gets with the program. 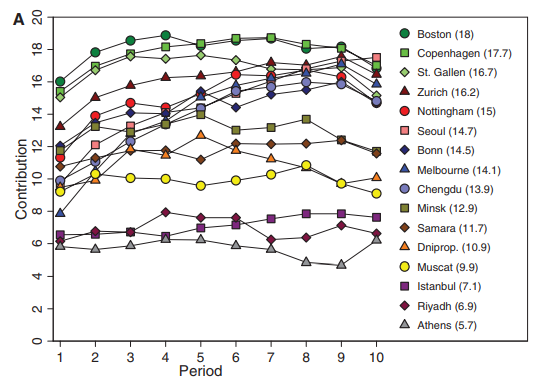 The graphs don't have confidence intervals but I think it's likely that there's no statistical significant difference between Boston and Copenhagen in that data. I think an under-appreciated aspect is suspicion of Officially Altruistic behavior. A ton of things people do even in countries that weren't run by communists that appear to be altruistic are actually self-enriching, and in addition a ton of things people do to help the less fortunate actually end up hurting them. I would yell at a lot of people if they started ostentatiously saying they were sacrificing for my benefit when I had never asked them to, and you could easily frame that as "anti-social punishment" if you BELIEVE that they're actually helping, but from a suspicious perspective they're both probably not actually helping me and they're also helping themselves. In communism, the State and the Party were the official sources of everything good. Private altruism meant competing with them -- an activity futile at best (because the good thing you were doing would have been equally provided by the system if you didn't interfere), and subversive at worst (because by doing it you were kinda suggesting that it actually wouldn't). If an activity is good, then "obviously" it is better for it to be provided by the powerful State guided by the wise Party, than by an unreliable petty individual. But this alone doesn't explain the punishment by other individuals. (Why waste my resources on punishing someone for wasting their own resources?) The explanation is that if you were doing a subversive activity (an activity that could be potentially interpreted as subversive -- and yes, that is a very large range of activities), sooner or later the State would find you and punish you; and afterwards it would start looking for your accomplices. By denouncing the altruists you were signaling your loyalty to the State. The stone you threw at the person trying to improve the world might become your get-out-of-jail card when the secret police started collecting potential enemies of the regime. -- Now the regime is gone, but the habits remained. I wasn't thinking about the experiment specifically, when I wrote that. Rather, the concept of "punishing do-gooders" reminded me of a few people I knew on the... Mečiar side of political spectrum... and how they viewed any pro-social activity, whether spontaneous or a part of some non-governmental organization. Shortly, people who help others (not their relatives) are either idiots or (more likely) a part of some sinister conspiracy against our state (most likely organized by the evil Americans, just like everything bad that happens on this planet). And this is my hypothesis on how that mental monstrosity has evolved; that thinking this way was the safe thing to do during communism. I wonder if me can think of an experiment that would distinguish between the two? No idea. Instead of this, I would probably try to make a qualitative research, i.e. instead of setting up an artificial experiment I would let them talk about famous real-life "do-gooders", ask sympathetically what exactly they hate about them most, and try to find the common topics in different people's answers. Oh, I guess I am making the same mistake again, by automatically assuming that the punished people in the experiment were perceived as actual "do-gooders" instead of repressive powers of impersonal state. Uhm, I guess I am not going to provide a better answer. Just saying that -- whether it is relevant to the experiment or not -- hatred against actual "do-gooders" is a thing that definitely exists in Slovak culture, and I suspect that it is actually a norm in many cultures, with Western culture being the "WEIRD" exception. Looking forward to meeting you the next week! There will probably be many new people at the meetup, and starting with a political topic would give a completely wrong impression of the Less Wrong culture. So, please let's keep this for the later part of the meetup. But I am also interested in other people's explanations. In some counties people dont take equal parts from the common pool. Moreover, in some countries, like Russia, most of people take negative part - they take nothing from the pool, but, nevertheless, get punished. So there isn't any reason to put anything into the common pool. Just a nitpick, from one non-native English speaker (to another ? ), I have been told that the word "retard" is extremely offensive (in american English at least). I'd say up to you to decide if that was your intended effect. Very tangential questions here. In these types of games does anyone use the concept of network effects in terms of understanding any of the behaviors and results?